The exotic beauty of Yenny Vaca Paz, is remembered for her brilliant participation in the contest Reina Sudamericana 1999, which fulfilled the role of host and also won the coveted crown. Before becoming famous nationwide, and had an interesting experience in Santa Cruz, where she was a model, excelling in various parades and covers, in fact, her picture in 1997 inspired the photographer Pablo Mnazoni to describe her show as "The magnificent, "which today is a benchmark of beauty and fashion in the country. 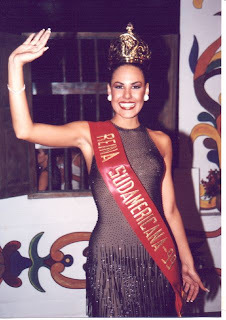 In 1998 she was Queen of the Carnival of Santa Cruz and a year later we saw her winning the crown of Miss Santa Cruz title that allowed him to compete in the Miss Bolivia 1999, being a great favorite, her only rival was the Tarija strong Raquel Rivera, who served second. Her stature and presence on the catwalk, made to shine at the Reina Sudamericana 1999, contest in our country and counted with the participation of 10 South American countries. Yenny Vaca won the third crown to Bolivia after Helga Bauer (dismissed) and Susana Barrientos. While her victory in the South American competition was the highlight of her year as Miss Bolivia, was the litmus test of their participation in the Miss Universe 2000, held in Nicosia, Cyprus. Although it is among the finalists, spectacular pike and competed against 79 beautiful women from around the world. The winner of the contest was the representative of India, Lara Dutta, who visited the country months later and was received by Yenny Vaca, who accompanied her activities in Santa Cruz de la Sierra. At the end of her reign, Yenny graduated in Economics and Finance in the United States and continued to represent Bolivia, but not in beauty contests, if not in the Bolivarian Games 2005, integrating the Bolivian national team basketball and defending the colors proudly our country.